A full-year, NSF-funded chemistry curriculum that embraces the three-dimensional learning of the Next Generation Science Standards (NGSS) for ALL students. Science and engineering practices, crosscutting concepts, and core ideas are seamlessly integrated. Students use their new chemistry knowledge to creatively solve their Chapter Challenges. 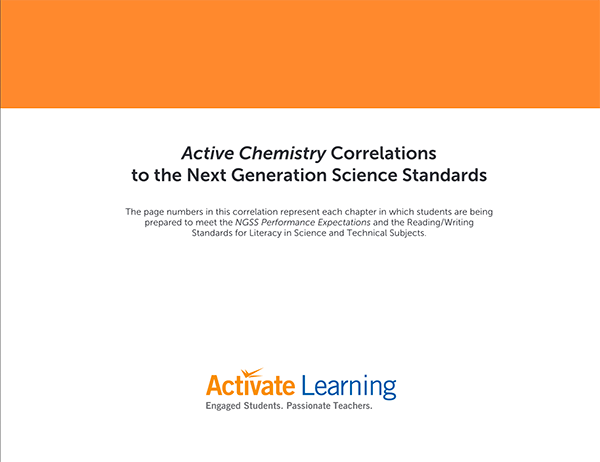 Active Chemistry Learning Community provides teachers with resources to prepare lessons as well as share and compare with other teachers in an online community. Online resources include daily lesson plans, pre-quizzes, student misconceptions, differentiation strategies, as well as videos that highlight the crucial chemistry for each section and videos that familiarize teachers with lab equipment and setup. to engage in scientific arguments using evidence and science knowledge, and promote a deeper understanding through public practice. Chapter Challenge: Students develop a movie scene that uses special effects which involve chemical concepts. Through investigation, students identify compounds and elements and decompose water. They examine the states of matter and relate them to molecular motion. Then they observe the Tyndall effect and differentiate among solutions, suspensions, and colloids. Students measure the volume and mass of liquids and solids to develop an understanding of density. They use flame tests to identify metal cations. They also learn about organic materials and use the law of conservation of mass to balance combustion reactions. Chapter Challenge: Students develop a game to learn about and use the periodic table. Students study the physical and chemical properties of elements and use the information to categorize elements as metals and nonmetals. They then learn about atoms, atomic mass, the law of definite proportions, and they discover how the model of an atom has changed over time. Students observe the spectra of several elements and learn about ionization potentials. Next, the students learn about the noble gases and discover the octet rule. Finally, students examine how the average atomic mass of an element is determined, the factors that affect nuclear stability, and the difference between fission and fusion. Chapter Challenge: Students create a work of art and describe the chemistry concepts used to produce the artwork. Students investigate acids and bases and speculate on their impact on outdoor art. They determine the relative reactivity of different metals and observe the process of electroplating. To understand clay, students examine a hydrated compound and apply the mole concepts to determine the formula of a hydrate. They investigate the production of precipitates in doublereplacement reactions, apply this to the production of paints, and then observe the effect of pH on natural dyes. Finally, they use borax to observe how different compounds produce different colors in “glass." Chapter Challenge: Students create a prototype of a “chemical-dominoes sequence” that can be sold by a toy company. Students investigate different ways to produce carbon dioxide to blow up a balloon. They discover that mass is conserved in a chemical reaction and learn how to balance chemical equations. They learn about stoichiometric calculations and calculate how much chemical they need to blow up a balloon. using magnesium as part of a circuit, students learn about the metalactivity series and redox reactions. They learn about the nature of light, phosphorescence, and ground and excited state of electrons. They build a conductivity tester and determine which solutions contain electrolytes. Students explore factors that affect reaction rates and learn how to determine whether changes are exothermic or endothermic. Finally, they use a rubber band to model enthalpy and entrophy. Chapter Challenge: Students create a toy that uses various chemical and/or gas principles. Students use the metal-activity series to construct electrochemical cells and explore the nanoscopic concepts of redox reactions. They use models to connect the size and shape of a molecule to its properties. They learn about Boyle’s law by examining volume changes with pressure changes in a syringe and changes in buoyancy with pressure changes. They explore Charles’s law in the context of hot-air balloons and generate and test hydrogen, oxygen, and carbon dioxide. using the knowledge they have gained, students determine the volume of one mole of oxygen gas and calculate the gas-law constant. Then they learn about Graham’s law by observing the effusion of hydrogen and carbon dioxide. Chapter Challenge: Students develop a demonstration of chemistry concepts for a grade-school audience. Students observe characteristics of a chemical reaction and use indicators to identify acids and bases. They examine single- and double-replacement reactions and practice writing chemical equations. Students observe endothermic and exothermic reactions and factors that affect reaction rates. They explore the properties of acids and bases and the activity of metals. Chapter Challenge: Students create a segment of a television cooking show that explains the chemistry behind the cooking. Students distinguish between heat and temperature and identify examples of convection, conduction, and radiation. Observations of a candle lead to a discussion of the control of combustion reactions and how energy is stored in and released from fuels. Students collect and graph data to generate the cooling and heating curves of water. Next they explore specific heat and the principles of heat transfer. The structures of primary, secondary, and tertiary proteins are examined in the context of the denaturation of egg protein. Finally, to clean up, soap provides the means for examining organic molecules of increasing complexity. Chapter Challenge: Students create a crime scene and prepare evidence that requires the use of at least three forensic chemistry techniques to solve the crime. Students use density to identify a sample of glass and then experience chemiluminescence as they use luminol to test for blood. using a flowchart, they identify six white powders and use doublereplacement and an oxidation-reduction reaction to develop invisible fingerprints on paper. To identify a piece of metal left at the crime scene and to etch a serial number, students use the metal-activity series. Finally, they use paper chromatography to separate black ink and learn about separation methods of mixtures.